With a recent $6.5 million grant from the National Institutes on Aging for the next five years, the multicenter consortium will generate new data and analyze existing data from a cohort of more than 2,000 volunteers. 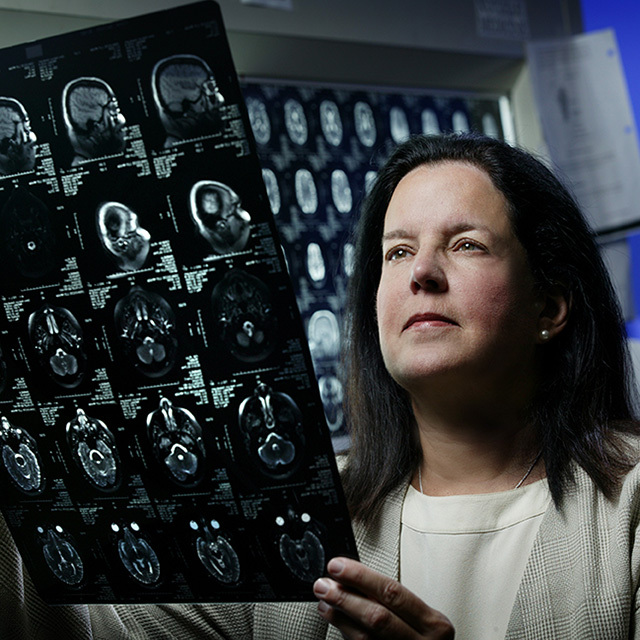 Marilyn Albert, director of cognitive neuroscience, helps spearhead the effort. Johns Hopkins leads a new consortium to create a broader patient base for research. One target: early interventions. Since Alzheimer’s disease was first documented well over a century ago, researchers have worked toward preventing and curing it, or at least delaying progression. However, says Marilyn Albert, director of cognitive neuroscience in Johns Hopkins’ Department of Neurology, there’s been little progress toward these ends. But knowing who to treat is tricky, she says. In the absence of symptoms, doctors would need to rely heavily on biomarkers that herald Alzheimer’s disease before symptoms develop. The search for reliable methods of early intervention is hampered by the fact that any one study is modest in size. While many of the world’s Alzheimer’s disease centers have amassed cohorts of hundreds of research subjects, they’ll need the statistical power of thousands to make headway. That’s why Johns Hopkins and four other institutions in the U.S. and Australia have joined forces to create the Preclinical Alzheimer’s Disease Consortium, a group that is combining their data to better understand the disease before it’s officially diagnosed. This consortium—made of Johns Hopkins; the Florey Institute in Melbourne, Australia; Washington University in St. Louis; the University of Wisconsin; and the National Institute of Aging’s Baltimore Longitudinal Study on Aging Imaging Substudy—got its start several years ago, with initial funding from the SHARP Foundation, Fidelity Biosciences, and the Alzheimer’s Association. This funding allowed the groups to begin to meet and combine data, which led to a publication in 2017 in Alzheimer’s & Dementia: The Journal of the Alzheimer’s Associationshowing that subtle differences in cognitive tests when people were normal was associated with an increased risk of progressing to mild cognitive impairment..
“The fact that we could combine everything together, even different tests and diagnoses given at different sites, showed that we could come up with something meaningful as a group,” Albert says. With a recent $6.5 million grant from the National Institutes on Aging for the next five years, the consortium will be able to do a lot more. Together, the group will begin to both generate new data and analyze existing data from a cohort of more than 2,000 volunteers. In addition to sharing data, each center will have special responsiblities: the Florey Institute will analyze blood specimens to look for Alzheimer’s related proteins; Washington University in St. Louis will analyze cerebrospinal fluid; the University of Wisconsin will examine lifestyle factors, such as physical activity; the Baltimore Longitudinal Study on Aging, Imaging Substudy will analyze positron emission tomography (PET) and other imaging data; and Johns Hopkins will serve as the coordinating site and will analyze genetic, vascular and depression data, and a subset of the imaging data.